A buffalo stabbing festival in Vietnam has been banned by local authorities following a long-term Animals Asia campaign against ritual slaughter. 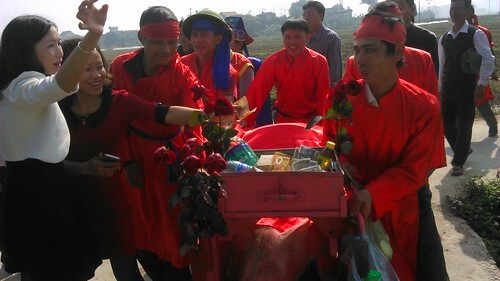 The mountainous Vietnamese province of Lam Dong has specifically stated that a bloody “buffalo stabbing” festival will no longer be allowed to take place. The move follows Animals Asia’s campaign to end the Nem Thuong pig slaughter festival, which culminated in the Ministry of Culture, Sport and Tourism instructing local provinces to stamp out all such “out-dated” and “uncivilised” events. The so-called “buffalo stabbing festival” has been practised by the K'ho ethnic group as a fertility ritual. It culminates in a buffalo tied to a pole being ritually stabbed to death with spears. In a press release the Lam Dong Province People's Committee claimed the violent and superstitious rite was no longer compatible with modern life and would not be allowed to take place in the future. In contrast, despite widespread condemnation from government and the public, the Nem Thuong pig slaughter festival has been allowed to continue for the last three years by the local authorities of Bac Ninh province. “We are delighted that the Lam Dong authorities have followed the directive from central government and announced an end to this barbaric practice. In February this year, Vietnam’s Dak Lak province announced that a similar festival would no longer be allowed to take place. “This is the fourth buffalo stabbing festival to be banned as a direct result of our Nem Thuong campaign. What we are seeing is a domino effect which we hope will see animal sacrifice festivals banned in every Vietnamese province. The Lam Dong festival is the fourth buffalo stabbing festival to be banned following similar announcements in Dak Lak, Hue and Nghe An. Three buffalo fighting festivals – in Phuc Tho (Hanoi), Phu Son (Bac Ninh) and Bao Thang (Lao Cai province), have also been ended. Following an Animals Asia report in 2013, 30,000 animal lovers signed an Animals Asia petition asking local authorities to end the Nem Thuong pig slaughter festival which takes place in Vietnam each Lunar New Year. The campaign attracted widespread media attention in the country and prompted condemnation by senior politicians including the Prime Minister and the Minister for Culture, Sport and Tourism. Meanwhile 79 per cent of Vietnamese vote against it in a media poll. Despite public condemnation and instructions from central government to end the gory rite, the provincial authorities have not yet ended the festival.